Change is essential. Change is inevitable. Change is the only constant, yadayada. 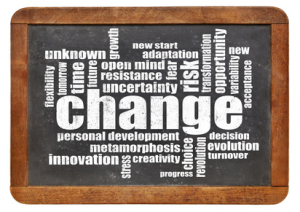 While there are many truisms when it comes to change, this is the one that really matters: change makes people uncomfortable and often fearful — not a state that allows folks to work at their best. A time of change often requires many meetings, closed discussions, whispers in the hallways and knowing glances between the senior team. While change is necessary, a secretive approach to change and information only serves to make your team curious, then nervous, then speculative and then fearful. Unless keeping people in the dark is absolutely essential (which is rare), share the process with your team as early and as often as possible. 1) What – what changes are happening? 2) Why – why are these changes required? 3) Who – who will be impacted by these changes? 4) How – how will our team, our customers and our organization be impacted by these changes? 5) When – when can we expect to see changes take effect? Information has so much more power when it’s shared. By sharing your five change essentials you’ll give your team the confidence and comfort to work collaboratively on achieving your organization’s change goals.